SKU: n/a. Categories: Bridal Jewellery, Pearl Necklaces. 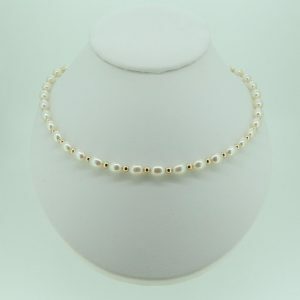 This white rice pearl and gold bead necklace comes in four lengths and can be worn either night or day as it is a little less formal than a standard pearl necklace. 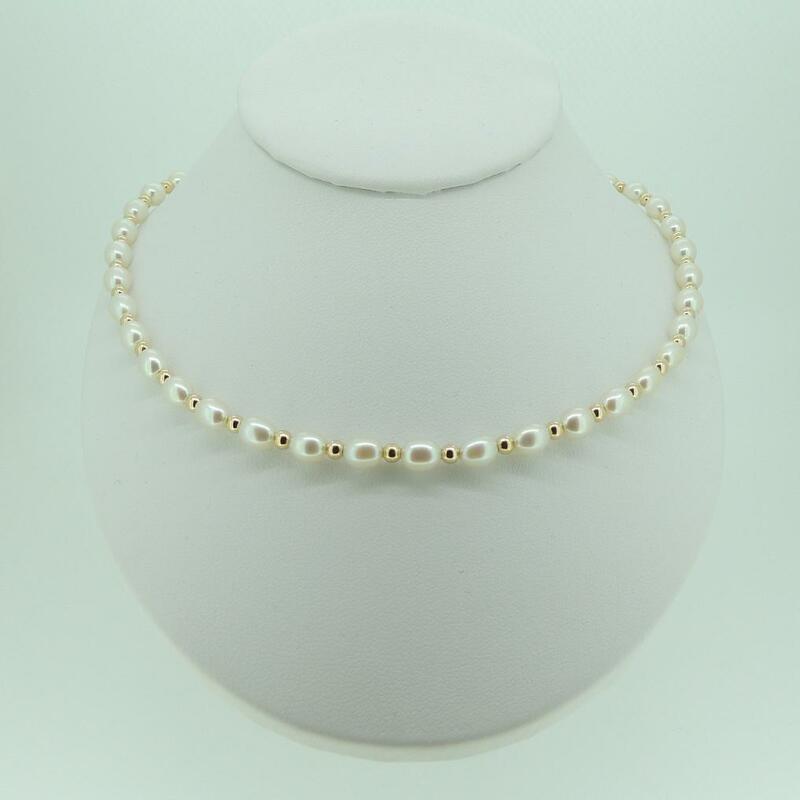 Strung on silk with a 9 ct yellow gold trigger clasp and a gold bead between each 6-6.5mm rice cultured freshwater pearl, this necklace has a very sumptuous look because of the combination of pearl white and gold. The two colours complement each other so well, with the deep richness of the yellow gold making the pearls look even purer and more lustrous, whilst the smooth moonlit understatement of the pearl enhances the shine and splendour of the gold. 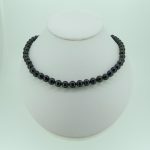 When you buy from M H Pearl Jewellery, you are guaranteed the very best quality at the most amazingly low prices. We do not just retail jewellery, we also repair and restring pearls – pearls are our passion and we hope that our customers soon feel the same way about them too. There are sadly a lot of fakes on the market and so we are particularly proud to be able to give a certificate of authenticity with every purchase. As soon as you open your pearl jewellery packaging we know that there can be no doubt as to whether the pearls are real or not – the moonlight gleam can’t be faked – but a certificate is our extra promise to you. You also want to present your gift well and also to care for your pearls after giving, so we are also pleased to be able to give a presentation case with every purchase. Pearls need a little more care in storage, especially if you have a lot of rings and necklaces with genuine stones, all of which are harder than pearls, which are a natural product from the oyster, rather than mined. The case will protect them as well as being a special part of present giving – the anticipation before opening and then the delight as the lid flips back are all part of the pleasure.